Who Should Own Your Influencer Relationship? 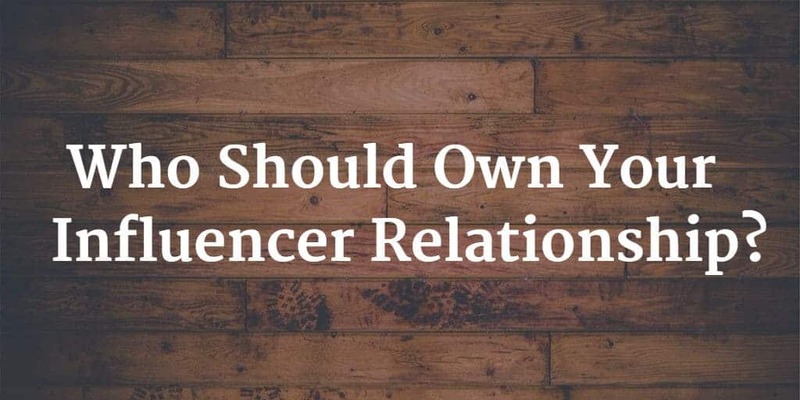 Home » Influencer Marketing » Who Should Own Your Influencer Relationship? Adding influencers to your marketing campaigns is a wonderful way to increase the draw, authority, and success of your content. And your relationship with the influencers shouldn’t be a once and done event. Those that continue to foster and build those relationships can utilize them over and over again in ongoing campaigns and turn those influencers into true brand advocates. Managing those relationships isn’t something that just happens. It takes time and effort to nurture, just like every other relationship you have in your life. While agencies offering influencer marketing services generally manage those relationships, here is what you need to know to decide who is best aligned to be in charge. Most hire an influencer marketing agency because they have the expertise to create a great influencer strategy, execute the outreach and manage the entire process. It easiest to let them manage both the process and relationship. Heck, that’s a big part of why you hired them, to help do the work for you. Allowing the agency to own that relationship with your influencers takes a lot of the leg work off your plate. They manage the outreach. They deal with the back and forth correspondence. They nurture the ongoing relationship, helping to grow it. They keep in touch with the influencer to continue to build your relationship, just like you would with a friend (and influencers should really become a true friend to the company). Letting your agency manage the relationship with influencers is the simpler route. It means leaving the hard stuff to the people you’re paying to do the work, and a lot less work for you. This all sounds like a great deal, but there are big advantages to owning that relationship yourself instead. While it is much easier to allow your agency to do the influencer relationship management for you, there are big benefits to taking on the task yourself. Who is in a better spot to represent your company, your self or your agency? Do they have the time to continually foster and build that connection? Chances are you’re the best to represent your company in just the way you want. A more authentic relationship is another benefit of managing the influencer relationship yourself. Influencers will feel far more valued if they’re in direct contact with the company they’ll be working with, rather than having to talk through an agency. Like the management of the relationship, the initial influencer outreach is also most successful when done by the company too. Put yourself in the influencers shoes. Are you more likely to say yet to a request that comes from a company you know, say Apple, or their agency you’ve likely never heard of? The work with your agency may not last forever. If it ends and they own your influencer relationships, what are you left with? Being in charge of the relationship means you won’t lose your connection with your influencers if you choose to move on from your agency. Picking who owns your influencer relationship doesn’t mean you can’t still allow your agency to do help execute your influencer campaigns. Instead, it can help to strengthen the bond you have with your influencers and increase your ability to utilize them to help in your various marketing efforts. While letting them own your relationships means less work for you, it can also mean less control and a less connected relationship. By choosing to own your influencer relationship, companies gain more control over their overall influencer programs. This doesn’t mean your agency loses out but rather is freed up to spend more time working on other pieces of your marketing projects. Pick the party who’s best set to own your relationships and build a better connection with your influencers today.